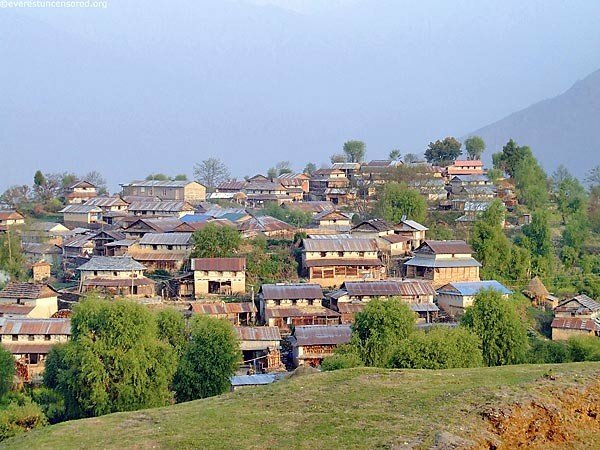 Ghale Gaun is an exotic pristine village endowed with an unparallel scenic grandeur and a home to Ghales the famed Gurungs the legendary mid-hill people of western Nepal. 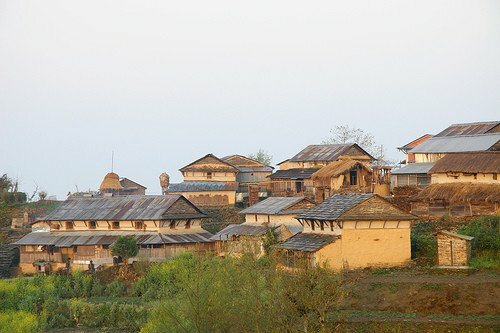 Repository of a unique ethnic culture Ghele Gaun is a true microcosm of stunning natural beauty mixed with an unspoiled ethnic life style. 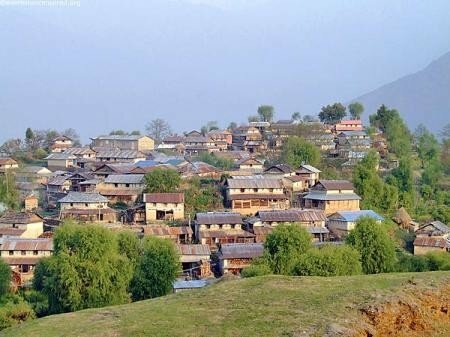 This village is located the district of Lamjung, Ghale Gaun is approximately 205km north west of Kathmandu and 125 km north east of Pokhara the picturesque hill town of western Nepal. 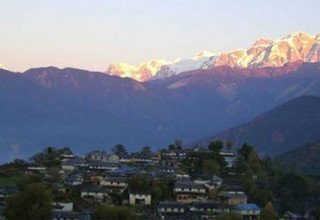 Ghale Gaun Perched atop a ridge at an altitude of 2016 meters from the sea level, Ghale Gaun is probably the only place which commands a superb breathtaking view of majestic western Himalayas including Machhapuchhre(6693m) Annapurna(8091m), Annapurna II (7939m) Annapurna IV (7525m), Lamjung Himal(6932m), Bouddha Himal(6974m), Himalchuli(6747m) and many more smaller peaks. 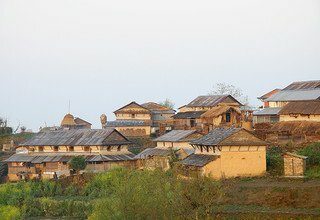 Taking advantage of such a unique location, Ghale Gaun- a picturesque hamlet of about 95 Gurung style houses, has recently been marketed as a new destination to experience Village tourism. Accordingly quite a number of houses have been prepared for domestic and international visitors with comfortable basic amenities. 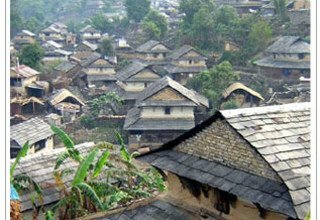 Besides the scenic extravaganza of the peaks, the warm and sincere hospitality of the Gurung people is also bound to overwhelm the visitors. Here food items such as grain, vegetable, meat, milk, eggs, are all locally produced and are indeed for any chemical fertilizers. 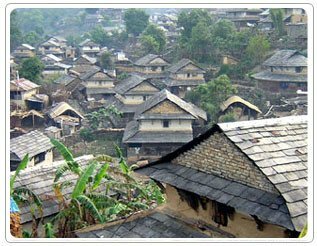 In addition, the life-style of the village truly reflects an exotic living ethnic tradition handed down since ages. 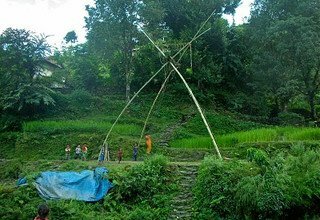 The social life is replete with interesting rituals of life cycle; birth, wedding, death etc., religious events and a lively cultural tradition of dance and music and it is well augmented by interesting locally produced exotic handicrafts and utensils. 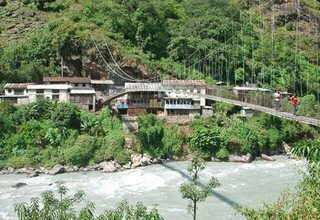 Activities around Ghale Gaun include bird watching at Talangyo Lake and visits to the Utter Kanya Temple, Pempro Fall, Batase Cave and the Khudi hydroelectric dam site. 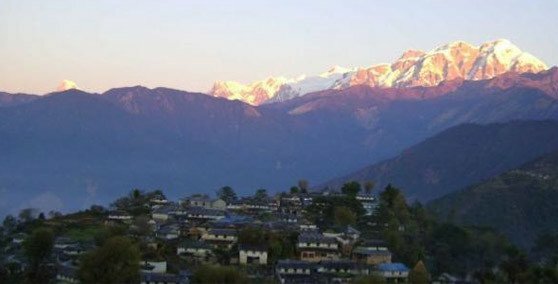 Major attraction: Magnificent Mountains view including Annapurna Range, Lamjung Himal, and Manaslu, unobstructed Sunrise & Sunset View, Buddhist Monuments, Waterfalls, Culture, Lifestyle, Wildlife, Natural beauty and warm hospitality. 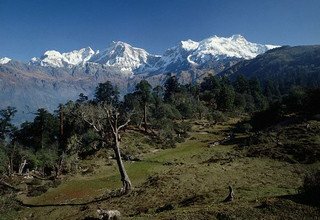 Day 2: Sightseeing tour in Kathmandu valley by private car. Overnight in Hotel. 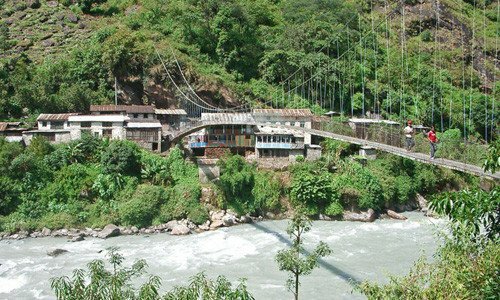 Day 3: Drive from Kathmandu to Khudi 790m (7/8 hours). Overnight in Hotel. Day 4: Walk from Khudi to Ghale Gaun 2’095m (5/6 hours). Overnight in Home-Stay. 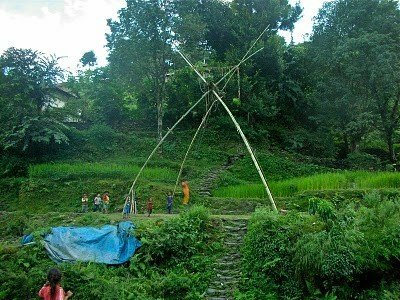 Day 5: Hike to Ghanpokhara Village 2’157m (1 hour). Overnight in Home-Stay. Day 6: Walk from Ghale Gaun to Beshisahar 760m (4/5 hours). Overnight in Hotel. Day 7: Drive from Beshisahar to Kathmandu (6/7 hours) and transfer to Hotel. 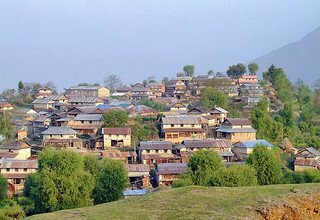 Day 8: Sightseeing tour to Bhaktapur and Patan Durbar Square by private car. Overnight in Hotel. Day 9: Departure to International Airport. 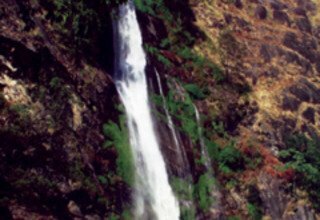 * All transportation (private car). 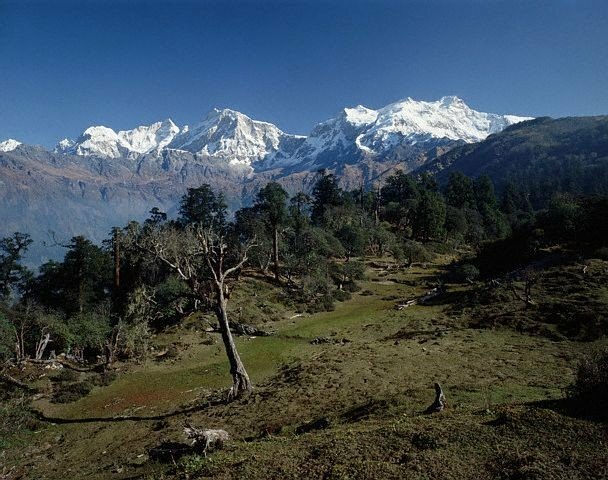 Note: In case of emergency during the trip, Helicopter will be arranged by Swiss Family Treks & Expedition (P) Ltd. The charges must be paid by the clients themselves. 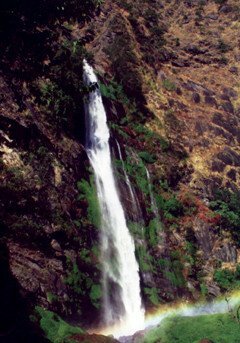 * Meals(breakfast, lunch and dinner) with Tea & coffee and hot/cold filter water during the trek. * Any meals ( Lunch and Dinner) in Kathmandu other than breakfast.